Pizza oven part 6: The first pizza! 'Tis the season for harvesting festive "greens"
I remember it this way: It was a crisp, autumn Saturday night. June and I were newly married, fingers laced together as we made our way across rain-slicked cobblestones to Patsy Grimaldi's under the Brooklyn Bridge. The smell of fallen leaves, the bright notes of coal smoke, baking dough and garlic danced in the air. After a long wait for a table, a pizza topped with roasted red peppers and mozzarella arrived at our table. The thin crust was bubbly with char from Patsy's super-heated brick oven. The cheese was sparsely applied and melted into a soft milkiness. Fast-forward to autumn in Maine with Fern and Blossom. The back-porch pizza oven had been curing with seven days of small fires to help heat-temper the masonry and avoid cracks. I started our first pizza fire with some dry oak split into narrow sticks to burn hot and fast. The fire was slow to catch, and using a flat shovel, I managed to shift it from the center of the oven to one side, where it seemed to draw better. I discovered that there was a clockwise turn of air through the oven, with cooler air drawing in through the door, past the fire and up towards the chimney. Finally the fire began to build and within an hour, I had flames licking across the inside doom of the oven, but the floor was only warm. After another hour, the floor was nearly 400° according the reading on my pocket infrared thermometer from Radio Shack. That would be hot enough to crisp the bottom crust. Speaking of pizza crust, I had mixed our favorite dough while the fire was starting. It's a simple recipe that June devised with a secret ingredient (yogurt!) that makes a nicely supple, soft dough. In the mixing bowl of a stand-mixer (or a large mixing bowl if you ware working by hand), add the water, yeast, salt, olive oil and yogurt. Stir until the yeast begins to dissolve. Add the flour to the liquid and using the dough hook, start the mixer on slow. (If by hand, stir until a loose dough is formed and then knead on a lightly floured surface.) As the dough comes together, increase the speed of the mixer to medium low until the dough is a smooth, but sticky ball, about 4 minutes. Lightly oil a large bowl with olive oil, transfer the dough to the bowl and let rise until doubled--about an hour and a half. Divide until two equal balls and let rest for about an hour on a floured surface covered with a clean dish towel. We spent time preparing the pizza toppings while the dough finished rising and the pizza oven heated. Fern carefully cut slices of fresh mozzarella. Blossom shredded some cooked chicken and mixed it with barbecue sauce. June caramelized red onions on the stove, sauteing them over low heat with a shot of balsamic vinegar and a tablespoon of sugar. I finished a tomato sauce made with chopped tomatoes, garlic, onions, and herbs. Finally everything was ready. I used one ball of dough to pat out a thin disc on a floured cutting board. I tossed a bit of coarse semolina flour on our pizza peel to keep the dough from sticking (you can use cornmeal, too). We topped the pie with barbecued chicken and onions. I got it into the oven with one nervous flick of the wrist then got to work on the second pie, which we kept simple with just tomato sauce and fresh mozzarella. The crust began to swell and the cheese bubbled. I gave the pizzas a half turn to cook them evenly. The pizza toward the back of the oven wasn't cooking as fast and the crust was still a bit doughy, but in a few minutes it caught up with the other pie closer to the fire. In about ten minutes they were both done and out of the oven, ready to eat. Our feast was a celebration of a fourteen month long effort of concrete and brick construction. We got lucky with that first firing. But subsequent tries have not always been as successful. Once after a heavy rain, the oven floor never really did heat up as well. I went for it anyway and the pizza was nicely browned on top, but still doughy on the bottom -- and it stuck. Yikes, what a mess. The other time we put two pizzas in the oven and there was a desperate chicken emergency. Fern and Blossom checked on the birds and found their second-favorite-chicken, Marmalade in terrible distress. She was dying. It was ghastly, and I sent a sobbing Fern and Blossom into the house with June, while I tried to comfort the poor bird until she expired. (What does one say to a dying chicken at such a time? Needless to say, I surprised myself with a more tearful goodbye then I imagined I was capable of.) The pizzas burned to a blackened crisp that night, but we weren't all that hungry anyway. Life goes on. And pizza is a circle. A symbolic representation of the cycle of life? Maybe. Or sometimes pizza is just pizza. It's something to think about as one year ends and another begins. Happy New Year from all of us! Let's face it, by this date on the calendar, 'tis the season for collapse. Those of us crazy enough to undertake a homemade Christmas (on any scale) are wishing for...surrender. From the flour that clogs the drain. From the piles of fabric that topple. From the unsent Christmas cards that taunt us when we close our red eyes past midnight. Who wouldn't wish the constant struggle to be over? But how sad to wish it over. These precious hours are never coming again. Never. I always resolve going into this season that I will enjoy it more. And I have learned to do that by being more realistic about what I can and can't accomplish and by demanding of myself that I see what is before my eyes, which is to say...two darling children who embrace it all. When the needle pops out of the sewing machine, it is an adventure to Blossom and Fern. "Now we get to learn how to put it back together!" When the two beep-beep-beeping timers are dueling, I forget which one goes with which oven. My girls don't. They delight in keeping me straight. Late nights when I topple into the lap of my big chair and grow still for the first time since I left my bed, they appear. Still awake! Still in full vigor in their footy jammies! They snuggle up with me and ask (again), "When are we going to read Scrooge?" We haven't re-read our Dickens yet this year. We shall, my dears. We shall. But we do have the gingerbread pieces baked for another family tradition that always signals the beginning of the fun part of Christmas, the relaxing part, the joyous part...the part where we four are together and staying that way. The girls will pipe together their houses and decorate them. And those sweet little houses will be the centerpiece of the holiday table...and our holiday home. We've taken to giving homemade gingerbread kits to friends we know will love the experience as much as we do. Inspired by Martha Stewart's version, we use our own cast-iron mold (one of our treasures). We put all the gingerbread in a gift tin or basket with some royal icing mix and some candy for decorating. It's a gift that fills our home with the cinnamon-nutmeg-gingery scent of Christmas itself and fills us with anticipation for the hour that is coming...it is coming...the hour when we will put aside our work and take up our play. Then, Christmas arrives. Our family is knitted together of strands that stretch back in time to the island of Manhattan and to a little town in the midwest where Main Street was also Route 66 and to the vast Yangtze river valley. We have many traditions to celebrate. This past week, we've been lighting candles for Hannukah. Along with the twinkle from the Christmas tree, the candles create a glow that warms us against the cold, dark approach of the solstice. All year, we anticipate these nights when we shred potatoes with onion and fry them on a griddle. But latkes wouldn't be latkes if we didn't top them off with our favorite mid-winter sauce: creamy horseradish sauce. The girls and I have to resist the urge to slurp it...well, sometimes we resist. Do try it, please. (Note: I leave out the garlic because I don't like the competition with the horseradish.) It's amazing as a dip for roasted vegetables. We've just managed to squeeze in this post as the last candles of the season are burning down, but we have much celebrating ahead...Christmas, then the festivals of Chinese New Year as we welcome the Year of the Tiger. Which means our holiday spirits won't burn down until February 28. Hope you won't mind joining us for our beloved traditions all along the way. One of the greatest pleasures of the season for us is bringing some of the outdoors into our home. The girls and I took a last ramble before the snow flew, and we brought in red berries and armloads of greenery. We've been making wreaths for friends (and the chickens' coop, oh yes!). We've dressed the mantel with a garland of hemlock and balsam and pine and also a teapot brimming with berries. We have some treasures that we keep from year to year...like these rocks that Grandpa Hickory found on a hike to the waterfall. Do you see what he saw in them? Of all the things we welcome inside for the holidays, the grandest is the tree. What reverence we feel to cook and play and make gifts in the company of something of such beauty and grace and importance. We do suffer qualms about how it has been sacrificed for our pleasure, but we do our utmost to return it to its earthly purpose. After Christmas, we use its branches to shelter the more tender plants in the garden, and in the spring, we mulch it. The profound presence of the tree vibrates all the more when it comes with a reminder of its place in nature. Often, we find birds' nests in the branches, and one year, we found two. We keep the nests in our ornament boxes with special glass treasures nestled in them through the year. Of all the gifts we've found in the branches of the tree, none has meant so much as the one we found two years ago. Do you see it? There. A monarch butterfly chrysalis. The abandoned chrysalis glowed with the lights of our Christmas tree and also with our memories of butterflies and summer days. Years later, it's still one of our favorite gifts from nature. We're home most days (at least half the day). But snow days are still snow days, which is to say special. They are not to be squandered but savored. Today was our first big snowstorm of the season. It snowed and snowed and snowed. It was the perfect kind of day for two things...playing outside and playing with noodle dough. When the hens are being generous -- and hallelujah, the Littles are now laying -- we like to stock up on fresh noodles. We use a cup of flour for every two eggs. The traditional way to mix the dough is by making a "bowl" of the flour and breaking the egg into the center and then drawing in flour with a fork until the dough has the perfect doughiness. (In our kitchen, we judge doughy perfection by whether it's as pinchable as one of the girl's cheeks.) Often, though, we toss both ingredients into the food processor and make a series of batches. We dry them on the same racks we use to dry our mittens and scarves after a good day on the snowshoes. On a day like today, all the racks get to work. Now we have noodles to add to soup or to toss with sauce for a quick dinner in the midst of all the work that's going on here for our homemade Christmas. Sometimes the noodles even become one of the homemade gifts: Dried into little nests, we tuck the noodles into a basket with a jar of sauce (Italian tomato or Chinese Tangy Orchid), clementines, and some cookies. It's a quick meal for friends as busy merrymaking as we are. What do you love to do on a snow day? Earlier in the week it was in the sixties! But yesterday we had the first snow! Rainbow Swiss chard in the back-porch planters. When it started snowing a little bit, Mommy, Blossom and I rushed out to the garden to pick the rest of the red cabbage and a few heads of bok choi and some Brussels spouts. when the temperature was 62 degrees F.
We left some vegetables under garden blankets, maybe for Christmas. We may have to dig through a snowbank to harvest them. But we do still have some greens handy in a little greenhouse planter box we made on the back porch. It has parsley, some leeks, mache, arugula, minutina, and spinach. At our house, it's time to play Christmas songs by the McGarrigle sisters (and Dean Martin and Yo-Yo Ma and Sarah MacLachlan and Elvis and...). Our favorite accompaniment? Candy-bar hot chocolate! We save this treat for special times, such as when we're trimming the tree, because it is a cup of chocolate so rich it's actually a kind of custard. We offer the recipe as a holiday gift to you... Choose your favorite chocolate (be it Hershey's or Callebaut, milk or dark-dark) because it's all about the chocolate. Beat the egg yolks in a small bowl. Place the chocolate and milk in a 2-cup microwave safe glass measuring cup with a spout. Microwave at 70-percent power for 2 to 3 minutes, whisking once, until the chocolate is melted. Whisk well. Slowly pour the milk into the beaten egg yolks, whisking constantly. Return the mixture to the glass measuring cup and microwave for one minute. If you're being fussy, strain it through cheesecloth to catch any eggy bits. But if it's just you and the family, pour into cups hot, then garnish with a lavish swirl of whipped cream and a festive sprinkle of ground chocolate. What will you listen to as you sip your chocolate? We're always eager to find our next favorite Christmas song. Please share! Sunday we hiked into our favorite woods in search of a tree to come spend the season in our home. The sky was high and blue. The pine needles gleamed in the clear light. And if we couldn't have snow, we were grateful for the fragrant green of the trees and the moss, the lichen and the ivy. For lunch, we sat by the swimming hole where the river is wide and slow. It's a sacred place: A decade ago, one July day, Birch and I lolled in that very spot and read the Times and didn't know that our daughters were being born on the other side of the world. Ever since then, it is a kind of rejoicing just to be there with our daughters. I reach out and touch their hair: Here, here, here, here at last, here to stay. On Sunday, sitting there, we ate a picnic of sandwiches and satsuma oranges. We listened to the birds high in the pines. The girls played along the bank, edging into the current when they dared. They found red berries and little ground ivy sprigged up like tiny firs. Someone else had been felling trees in our woods, and we crouched down and marveled at the beaver's tooth marks. We snipped evergreens for garlands and wreaths. We cut a tiny tree for the chickens, another for the cat, and one for us too. It made us sad when the tall one came down. Fern said, "It was alive just then, but now it's not." Why did you go and fall on me? Then it was home-again, home-again for our luscious, Christmas-tree-cutting hot chocolate, a hot chocolate so delicious that we can never help but end up with whipped cream on the tips of our big red noses. If you'll kindly stop back by tomorrow, we'll share our special recipe. One spring, when the girls were about four, we were out for a walk in the woods. As we squished along in our boots, I said it was mud season now and soon it would be bug season. Blossom piped up and asked, "When is it gonna be fairy season?" As it turns out, in our woods, it is always fairy season. 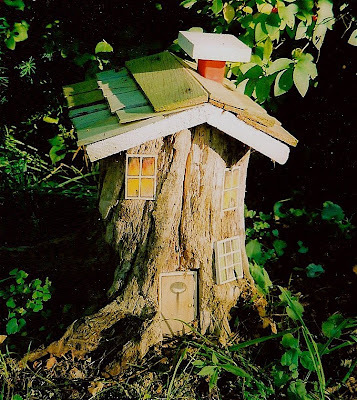 And, thanks to Grandpa Hickory and his whimsy, it is not hard to imagine why our fascination has such deep roots: He builds fairy houses out of tree stumps. His granddaughters weren't very old before he had given them their own hickory-handled hammers so they could help too. We used to live in a pine forest, and as the trees came down in the big winter storms, Grandpa Hickory reclaimed the stumps for the fairies. We're always sad to lose a tree. It was especially hard to hear that the 80-foot pin oak had died in Grandpa Hickory's back yard. Years ago, we had our last family reunion with his family under that tree. To ease the loss, he's built a mansion big enough for a fairy family reunion. We haven't yet made it home for a visit to Missouri so that Fern and Blossom can enjoy this gift from their grandfather, but we are told it stands taller than they do. 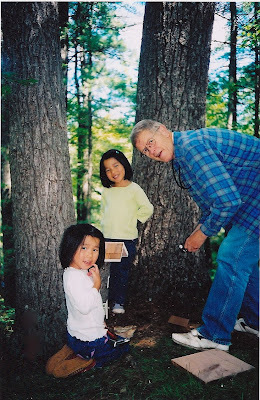 The girls can't wait to see the new fairy house...and the very special grandfather whose imagination soars with theirs.